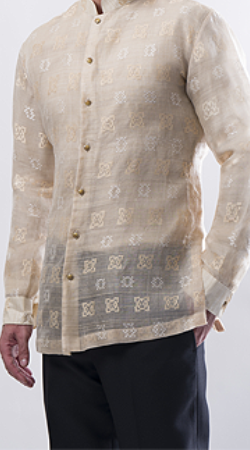 The Barong Tagalog, also known as Barong, is an embroidered formal dress shirt in the Philippines which is usually worn over an undershirt. Today, in the Filipino culture it’s a very common formal attire as well as an ordinary office attire. 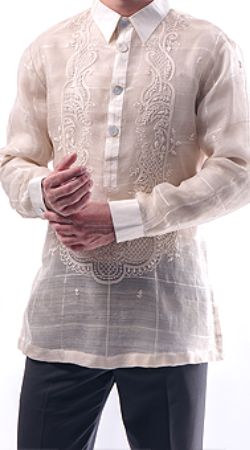 Many people love to wear Barongs at weddings and other formal occasions. Many also use this as an office uniform or school uniform. 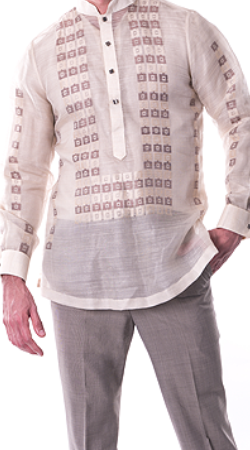 Originally it was more of a formal dress shirt for men but today there are many women who also wear barongs. 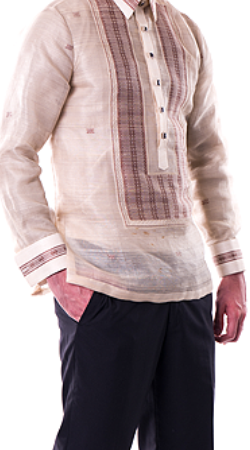 Exclusively His Tailoring does custom-made barongs whether it be for the office, special occasion, school or as a gift. We have many pictures and samples for you to see them in detail. *All prices include labor and standard materials. These price ranges are indicative and may vary depending on the type and quantity of fabric needed, as well as other requests. Our barong designs are unique and only a few pieces are produced for each design. The design on our website may no longer be available at our stores, but each store will have other designs to choose from. Inquire About Custom Made Clothing Today! Exclusively His makes custom made barongs, shirts, suits, and pants. © 2017 Exclusively His Tailoring. All Rights Reserved.